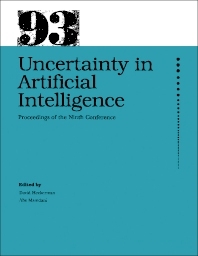 Uncertainty in Artificial Intelligence contains the proceedings of the Ninth Conference on Uncertainty in Artificial Intelligence held at the Catholic University of America in Washington, DC, on July 9-11, 1993. The papers focus on methods of reasoning and decision making under uncertainty as applied to problems in artificial intelligence (AI) and cover topics ranging from knowledge acquisition and automated model construction to learning, planning, temporal reasoning, and machine vision. Comprised of 66 chapters, this book begins with a discussion on causality in Bayesian belief networks before turning to a decision theoretic account of conditional ought statements that rectifies glaring deficiencies in classical deontic logic and forms a sound basis for qualitative decision theory. Subsequent chapters explore trade-offs in constructing and evaluating temporal influence diagrams; normative engineering risk management systems; additive belief-network models; and sensitivity analysis for probability assessments in Bayesian networks. Automated model construction and learning as well as algorithms for inference and decision making are also considered. This monograph will be of interest to both students and practitioners in the fields of AI and computer science.